FA: Alan Nelson, Vaino Kodas, July 1986. Super sustained slab, Cross Reference is a good example of why many slab routes are so runout. It would be nearly impossible to try to stop and drill a bolt in the middle of the long crux section (it would be hard to clip a bolt even if was already there. ), and thus a very bold and dangerous route resulted. 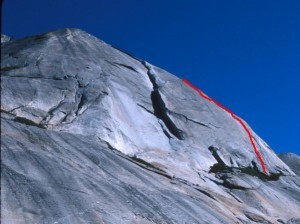 Luckily, it’s easy to toprope the first pitch from the anchor under the flake on Hermaphrodite Flake. Which SuperTopo guidebooks include a topo for Cross Reference?